It perfectly encapsulates the conflict that occupies nearly every financial decision you make in your life (whether you want to admit it or not). There are people that take this inner struggle to the extreme. There are those people who save nothing, live paycheck-to-paycheck and never plan ahead for their future financial well-being. And then there are those people who are frugal to a fault and never spend any money or enjoy themselves. For the rest of us, we are constantly trying to strike a balance between enjoying life now and ensuring we have the resources to enjoy life later. There is no ideal balance for everyone because we all have different goals, needs, resources, expectations, and desires. The hardest part about planning for your financial future is the simple fact that we don’t know what’s going to happen. No one has things all figured out because no one knows the various curve balls life is going to throw at them. My thoughts about this have changed over the years. I’ve been a saver for as long as I can remember. So balance for me has been reminding myself that it’s okay to spend money now and enjoy myself. A life with a full bank account but no experiences or enjoyment is pointless. Spending priorities change over time. After I got married my wife and I wanted to travel as much as we could before having kids. Now that we do have children travel has taken a back seat to spending on things like time, experiences and activities for the kids. I also don’t want to miss out on a vacation with my kids just so my wife and I can retire a few years earlier. Get the big things right and don’t worry about minor purchases. It’s not the minor spending decisions you need to worry about. Get the big things right and you don’t need to worry about the minutiae. How you plan for the huge purchases in your life (transportation, housing, etc.) will have a much larger impact on your finances than how much you spend on Starbucks or Chipotle. The missing link in personal finance advice is making more money. Personal finance experts are constantly preaching the benefits of cutting back and saving more money. Very few ever discuss how important it is to improve your career prospects to increase your paycheck. This is obvious, but making more money makes it easier to achieve some sort of financial balance, assuming you’re able to keep your lifestyle inflation in check. Your spouse’s views about money make a huge difference. If you’re not on the same page as your spouse philosophically in terms money, saving, and spending it will be very difficult to get your financial house in order. Your life will also involve a whole lot of stress. Treat savings like a monthly bill. Automating your finances is probably one of the best things you can do to increase savings, and avoid unnecessary fees, late charges, and stress. I view savings as something like a bill payment I have to make each month (or week or quarter, etc.). Each account I have automatically pulls money from my checking account on a periodic basis so I know I’ll never be tempted to spend it in the first place. This is huge from a psychological standpoint to make saving less painful. Guilt-free spending helps. Automating your savings allows you to avoid having to use willpower to force yourself to save. It also allows you to spend money without feeling guilty about it because you’re simply using what’s left over. This also allows you to spend more on those things that make you happy and cut back elsewhere on those things that aren’t a huge priority. Save & enjoy. My strategy whenever I earn extra income or a bonus over the years has been to save a decent chunk but also carve out a piece to spend some of it now in an enjoyable way. This still doesn’t answer the question of how much is enough in terms of saving for the future but there are no easy answers to this stuff. 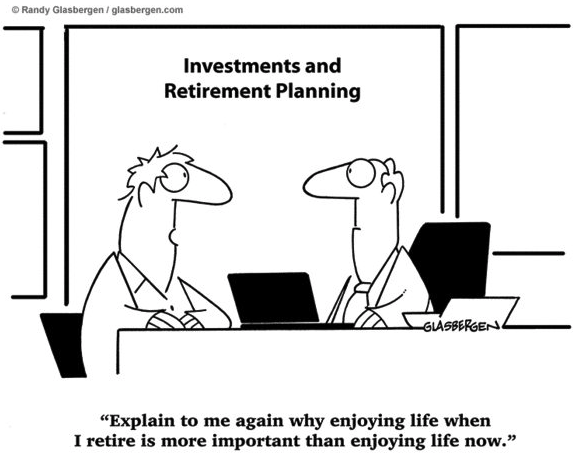 The other consideration is that the best time to save and invest is when you’re young. The paradox here is the people who usually have the means to save (older people) don’t have as much time to allow compound interest to work in their advantage while the people who have the time to allow compound interest to work in their advantage (young people) usually don’t have the means. I guess the best you can do is get to the point where you’re not stressing out about money all the time, whether that’s how much you’re spending now or how much you have saved for the future. Maybe living a wealthy life is really about avoiding the stress most people feel about money.